A conscientious objector, translator Balaban; an eighteenth century concubine and poet, Ho XuÃ¢n Huong; and a linguist from New York University, Dr. NgÃ´ Thanh NhÃ n; have created a book rife with firsts. Like many groundbreaking, nationalistic writers, Huong wrote her poetry in the vernacular of her people, the Vietnamese. Through the efforts of NhÃ n, the original ideographic script, Nom, has been replicated for the first time using moveable type. Balaban discovered the writer while doing humanitarian work during the Vietnam War. Most scholars believe that Huong was a concubine who lived at the end of the second Le Dynasty, a period of social and political unrest. From this chaotic daily life, Huong drew her subjects of patriarchy, sexuality, and power. On the other hand, they also read powerfully as sexual poems, employing sensual double entendre. Because the book is formatted to show, over a double-page spread, the poems written in the original Nom, modern Vietnamese and the translated English, a knowledgeable reader can derive even more pleasure from the word play created by changes in the tonal language. 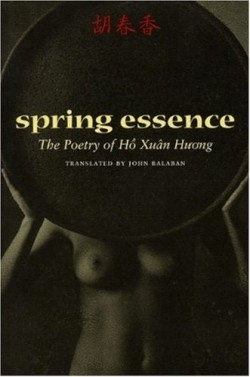 The meaning of Vietnamese words changes based on tonal inflection; Huong exploits this linguistic trait, and Balaban clues readers in through his careful and informative endnotes. I haven’t shaken grief’s rattle, yet it clatters. I haven’t rung sorrow’s bell, though it tolls. with a fate that says I am much too bold. Men of talent, learned men, where are you? Am I supposed to walk as if stooped and old? This collection places readers in two triumvirates; one of history, sexuality, and literature; the other of poet, translator, and linguist. The finished product is an interdisciplinary experience few books can replicate.